Host Club is a club of handsome boys at Ouran High School who entertain the girls glamorously. All of a sudden, the coolest person in club, Kyouya, turns 180 degrees and Tamaki is jealous of seeing Haruhi correspond with director of Ouran Academy. In the middle of the disturbance, suddenly all club members fell into underground world. Hmm … So, no one made a review for Ouran High School Host Club light novel which is pretty decent to read? I know it’s pretty late, but alright … let me to write the first review for this light novel. I will try to make this review spoiler-free. Actually, I recently read this book after previously watching anime from this series. I found this book in the nearest bookstore. This book was published about two years ago in my country, but it doesn’t seem to be much sold. So, the price is discounted to attract customer. Lucky me! I can buy the book with cheap price. However, I feel sad to see these books still pilling up there. Without a doubt, that is the risk of physical book sales regardless the type. The light novel contains two volumes. The first one called ‘The Extraordinary Days’ and the second one called ‘The Treasured Days’. The story of the light novel is still telling about Host Club at Ouran Academy, but all the stories are not in the manga. Each novel contains three chapters. The writing of the light novel involves three different authors which means there is a different style of storytelling. It’s like an official fanfiction which is approved by the original author. It can be seen in the writing of stories that still have characters and plot that are still related to the manga that have been created before. If we assume, the story in this light novel has the same timeline with the manga. The novel begins in 2008 to 2009 and the manga ends in 2010 with total 18 volumes. On the whole, the story of this novel has the same drama and comedy aspect as the manga that can make you giggle. Because it’s a written work, then many stories are described in detail that can’t be imagined if you haven’t watched the anime and read the manga. Therefore, I recommend you to do one of those things so you can understand what's going on in the light novel. All the characters here have their own characteristics so there are no character developments there. Nevertheless, their behavior never fails to amuse me. In my opinion, there’s nothing can be said about character developments because the traits of all characters are appropriate. Although all stories are made by others, the illustrations for this light novel are still made by the original creator, Bisco Hatori. As usual, the arts she draws attract the readers as in manga. The illustrations depict particular events well, for instance when Tamaki imagined he was staring at Haruhi who was blushing. But as always, Takashi is still depicted as having no expression in any situation. Moreover, on the front page of each volume there is a colored folding picture of host club members with different themes and costumes. The different costumes at certain time is characteristic of this club. The arts drawn are quite refreshing and full of color … and also reveal the other side of the club members. That is an advantage for this light novel. Overall, I really enjoy Ouran High School Host Club light novel. Although it’s not a perfect light novel, but I give it 10 based on my enjoyment. The essence of light novel from a manga series is content exclusivity. It can be found in this novel. 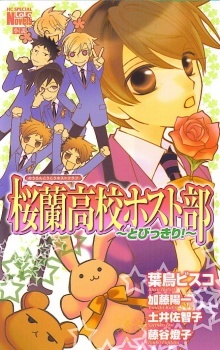 If you enjoy manga or anime Ouran High School Host Club, you probably will enjoy the light novel.